The AGA Crosstab system is a very odd duck. It was really something that was semi-cobbled together and since then has had very few changes. In the current/existing system the page reads as: Player – ## (this is the number from the TD system), Rounds and results (Try hovering your cursor over the numbers, it will show you the name of their opponent), and overall result for the tournament. 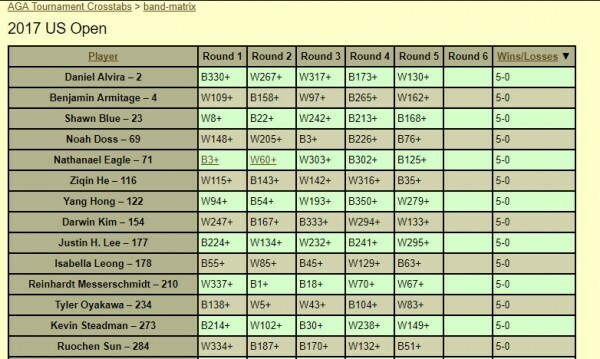 In the rounds columns the numbers display as something like “4B+”. This means that the the player’s row you’re looking at played player #4, they played as Black, and they won the game. If you look at player 4, it will show they played player X, played as White, and lost the game. Hovering over the result will again show you the name of the opponent.